Whether you are replacing a sofa or starting from a blank slate, we will assist you in adding elements that transform your vision into reality. Whatever your goal, Kloss Furniture and Mattress can help you pull it all together! At Kloss, we believe decorating is all about what is right for your personal style and needs. Interior designing just got easier with our complimentary online room planner. 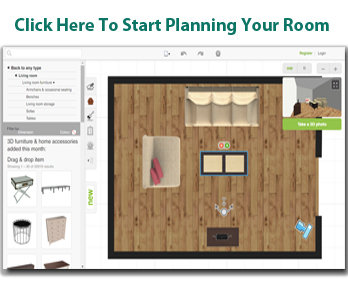 This interior design and floor planning software is yours to use for free. Our software features design templates for you to start working with, or measure your own room and lay it out to scale. Just type in your room dimensions, add or remove walls, and start dragging furniture into your room. Also look for a selection of kitchen, gym, home theater, garden, and other house hold items to help your planning. Need additional help? Come in to talk with our Interior Design staff.